Upon the request of Yaoyao who arranged the welcome ceremony program in Heshan City, I prepared a song to sing. I did not have the chance to practice well because I was just informed the night before. I became busy browsing the internet for possible songs. I was lucky that I got it. I finally downloaded the lyrics and the music minus one of the song Be My Lady. I chose this song because I had the experience singing this song in Japan before and I found it to really giggle the ladies. Serenade or harana is rarely being done these days. 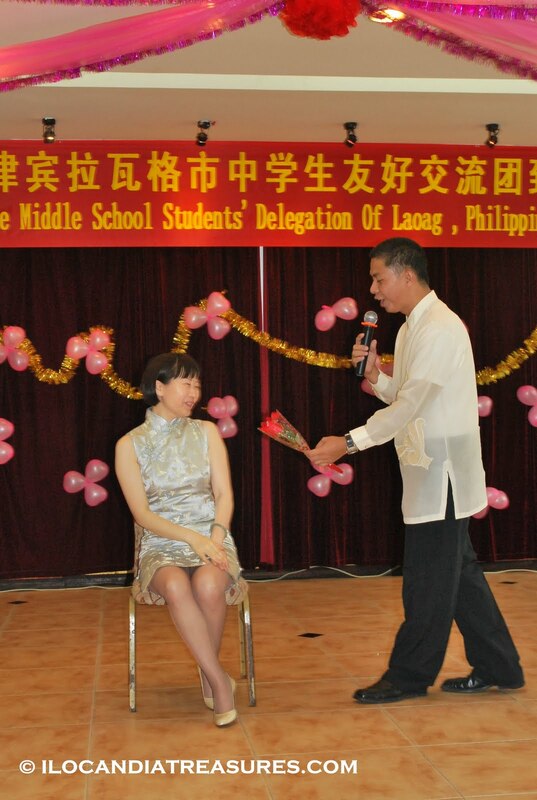 Its a Filipino tradition that I showcased in China. So on the performance itself, I just requested them to play the music and flash on the screen the lyrics so that I can follow it. It went well. I serenaded three Chinese ladies consisting of two big bosses in the education department and a student. Is it hidden in your smile? 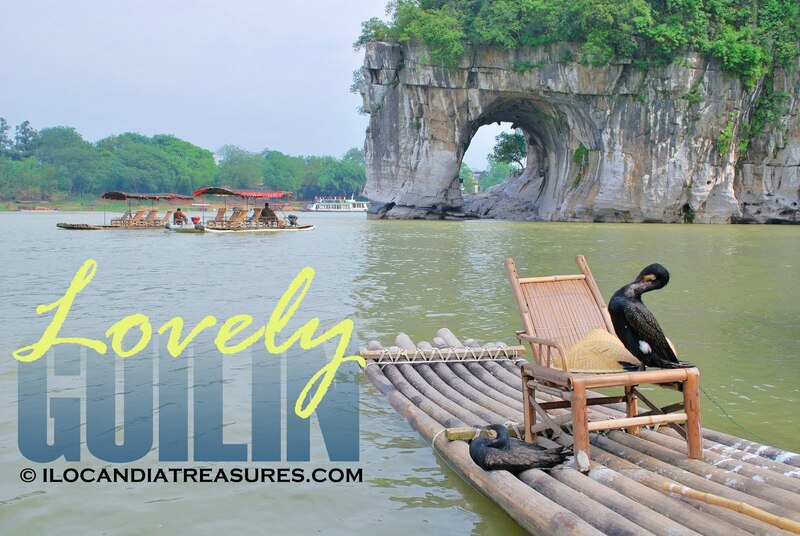 We were truly being given a big surprise to our visit in China that is a side trip to Guilin. It was such a place of wonderful sights and sceneries. According to popular Chinese saying, “Guilin’s scenery is best among all under heaven.” Under heaven means tianxia in Chinese. It is a phrase in Chinese language which denotes the entire geographical world that includes lands, area, and space divinely appointed to the Emperor by universal order. The name means “forest of Sweet Osmanthus.” It was owed to the presence of large number of fragrant osmanthus trees in the area. It was my first time to hear this kind of flowering tree. We have seen these trees but no flowers because it was not yet its season when we visited. We were amazed to see and try products made from the osmanthus flower such as cake, candy and wine. They really smelled and tasted the fragrant of a flower. Guilin is a prefecture-level city located in the northeast side of the Guangxi Zhuang Autonomous Region on the west bank of Li River. It has an area of 27, 809 sq km with a population of 1.34 million. According to our tour guide, if our cameras and imaginations combine may give us better shots of the places. There are several hills, rocks, and caves here which may be interpreted into unique forms. We were accompanied by Charly Zhang and Yaoyao on this trip. 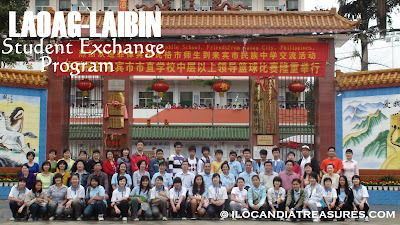 It was a three-hour bus ride from Laibin. We were billeted at Guilin Jinpu Hotel. We visited the landmark of the city that is the amazing Elephant Trunk Hill. It is a hill that resembles the shape of an elephant nose or proboscis. 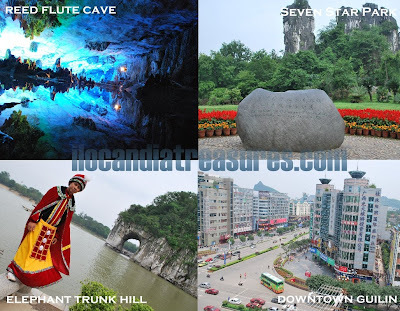 We have seen the majestic Reed Flute Cave full of stalactites and stalagmites. This measures 240m in length with three entrances. This cave is over 180 years old and it was discovered by a group of refugees in 1940s. It has received many very important persons. We walked through this cool cave reaching a portion with a small lake inside with artificial lighting. As a highlight, we had a night cruise to four lakes and two rivers namely Li River and Peach Blossom River. On this romantic cruise we have seen the miniatures of the Golden Gate Bridge, The Arch of Constantinople. We passed by the Pagoda twin towers (Sun and Moon). We ended our night out with shopping at Zhong san Road. We haggled with the prices of the products by starting off at half going up. Lucky we were, as we bought cheap items for souvenirs. On our second day, we visited the Seven Star Scenic Area Park particularly the historic spot where former US President Clinton delivered his speech advocating the protection of the environment then lastly we visited a gem stone museum where we saw emeralds, ruby, tiger’s eye, amethyst and many others. With what I have witnessed on this very short trip I instantly fell in love with the beauty-laden Guilin. I hope to see her again next time. With my colleagues from The Ilocandia Photographic Society (TIPS), we truly had a different kind of wine experience in Adams. Just imagine that early in the morning we started drinking rice wine when we visited the winery of Lola Ingga. An elderly woman clad in a traditional wear. She had been into winemaking for over 40 years. 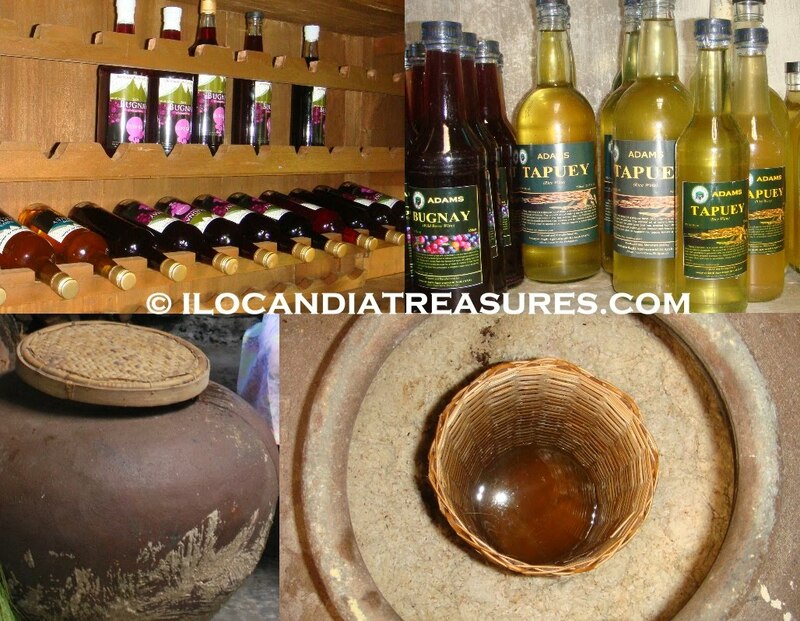 She explained to us the procedure of making, fermenting and refining tapuey or rice wine. She mentioned that freshly cooked rice is being used. Dry it in a bilao then transferred to a banana leaf then to an earthenware jar. She has many of this to ferment rice wine. She basically mixed the rice with yeast. She put in a cylindrical bamboo tube to separate the liquid from the rice which is easy to scoop from after its fermentation. The jar has to be sealed thoroughly and shall not be opened to ensure proper fermentation. Rice wine is an alcoholic beverage made from rice by way of fermentation of rice starch converted to sugars. This is closely similar to brewing beer but this uses amylolytic process. Tapuey in Ilocano dialect is fermented from six months to two years depending on the desired strength. Tapuey is similar to sake of Japan and maotai of China. 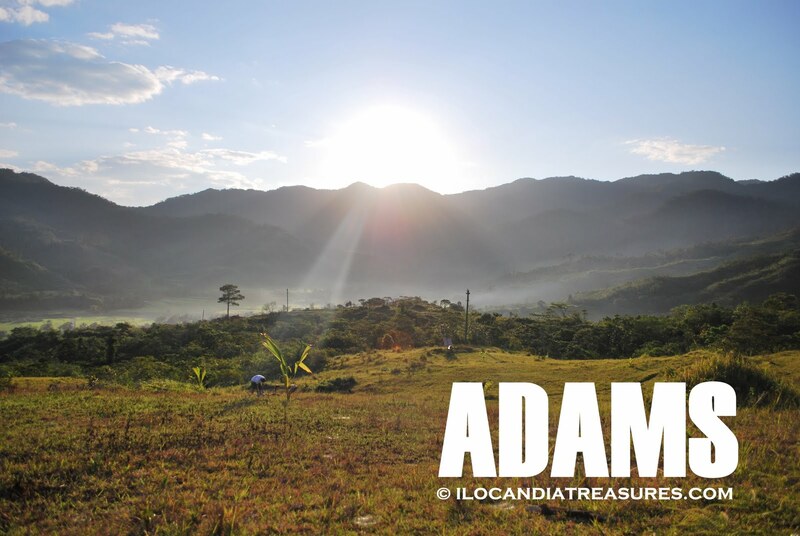 The different ethnic tribes of Adams such as the Bago, Imallod, Kankanaey, Yapayao and Ilocano have engaged into winemaking. Practically all households make wine for their own consumption, for their guests to try or for business. Because of abundance of materials such as the wide variety of fruits seen in the town, they simply considered and turned these into fruit wines. I was amazed to find out that all kinds of fruits can be made into wine. At Lyns place, we were offered to drink the red berries wine which she actually formulated. This is intended for her guests only. I find the taste of her wine just so good, and not so sweet. While at Dr Biel’s winery, I tried the santol, passion fruit and of course the common wine that is wild blackberry or bugnay. She also made vinegar out of bugnay. Pineapple, banana, mango,duhat, assem and rattan are also made into wine. They want to promote wine drinking as part of their healthy lifestyle just like the Westerners. They also want to promote tourism as well make business out of it. The price of a bottle ranges from Php100-200. This wine tasting is one great activity that travelers and guests to Adams should not forget to try. Kampai and gan bei! While I was under the hanging bridge in Adams, I noticed that there was a group of young boys at the Bolo River who were busy submerging their heads on the water. I thought they were swimming but when I went closer to them, they were actually fishing. They were naked and some were on their underwears, with a little fish basket called alat tied around their waste. A goggle was all their equipment to fish. They just snorkel in the water and find their prey. They watch the fish and cleverly catch them with their bare hands. I was amazed by these young boys' great skill in fishing. I was shown how they catch eels or kiwet from the river. They put some cylindrical trap underwater, stabilized it with some stones and leave it overnight. The trap has one way opening that when an eel enters it could not get out anymore. They collect these traps the following day. We saw in the river some young girls who fish different kinds such as crabs or kippi, small shrimps and fish by hand with the aid of a small net. It was fun to do fishing also when I tried at the pond of Lyns place where they grow tilapia. It was an easy thing to do. One can also do angling with the use of a hook to catch them. Fishing is an activity of catching not only limited to fish but also includes other aquatic animals such as mollusks. 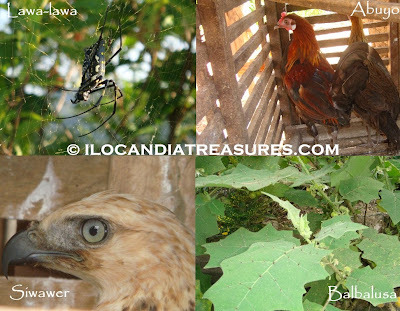 It is called panagkalap in Ilocano dialect. This is an ancient practice that dates back to the Paleolithic period or some 40,000 years ago. This is the main occupation of people living in the coastal areas and any bodies of water. There are different techniques that can be employed in fishing. 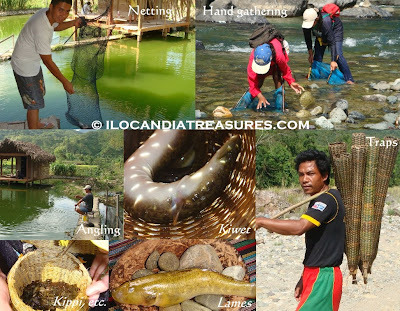 These are netting, spearing, hand gathering, angling and trapping. Whatever technique you choose, I would say happy fishing! With my colleagues from The Ilocandia Photographic Society (TIPS), I was happy to go back to a paradise called Adams. We were invited by Dr. Bielmaju Bawingan for a pictorial shoot of the beautiful sights and sceneries in her town intended for a tourism project. We were assigned individually to cover the various waterfalls. I was escorted by a local as we hiked for a period of time. We even crossed rivers to reach these falls. I particularly visited Pao Falls. It was incredibly beautiful. We passed by the hanging bridges which they use in times of high water on the river. I saw some boys who fish on the river with their clever hands and goggles. We proceeded to the hut by the Bolo River near the town proper. The locals prepared exotic foods and we photographed them one by one. We waited for our colleagues to arrive from their assignment. 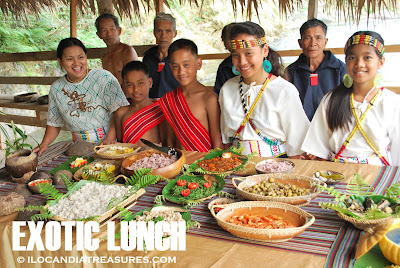 When we were complete, we dined together with the local folks and savored the food. We shot the indigenous people in their ethnic costumes. We were surprised to see and learn that some of the young girls were product of intermarriages among the ethnic groups. They danced while some played their indigenous musical instruments. After a very long day, we dipped into the Bolo River for a night swim. The water was so cool and we were refreshed. Then we were served with sumptuous dinner at Anavic’s homestay. To cap our day, Dr. Biel requested the local string band to perform for us for a night of wine drinking with bugnay and a pulutan of fried frog. It was like staying in a first class resort. We targeted the Lover’s peak on the following morning to capture the sunrise there. 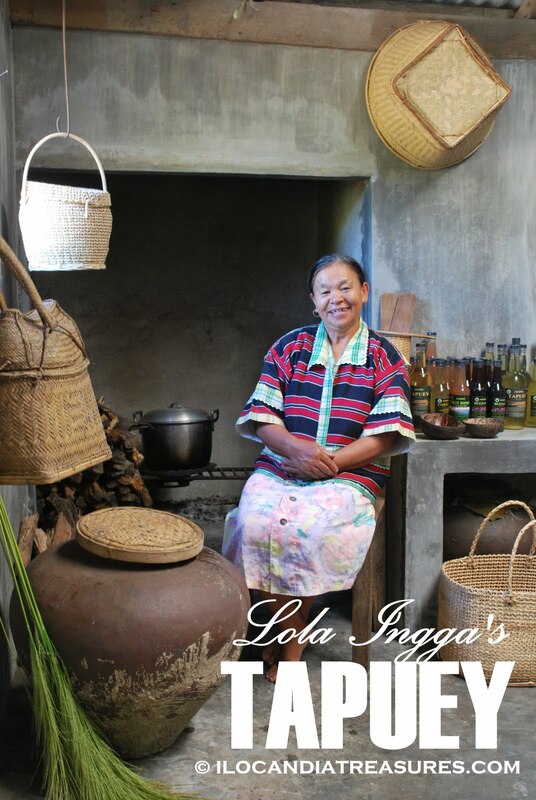 We later visited Lola Ingga to see how she makes tapuey. She oriented us of the procedures until she offered us to try the rice wine. At that very early time of day we started drinking. We were also shown some of the broom, a local product, made of tiger grass. 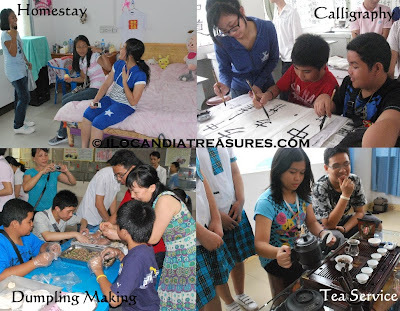 We visited and photographed the various homestay facilities for guests and tourists. We were treated for a great lunch in a small hut by the pond at Lyn’s place. It’s a special place that offers good native food and great ambiance of nature. Definitely fishing will be a fun thing to do there. Our last stop was at the winery of Dr Biel. She has a big production of bugnay wine and other kinds. This trip to Adams was indeed another awesome experience. It was full of fun and discoveries. Tobacco is an agricultural plant that is cultivated for its leaves. It belongs to the genus Nicotiana. This word as well as nicotine is in honor of Jean Nicot, French Ambassador to Portugal who sent tobacco as medicine to the Queen of France. It can also be used in some medicines or as an organic pesticide. 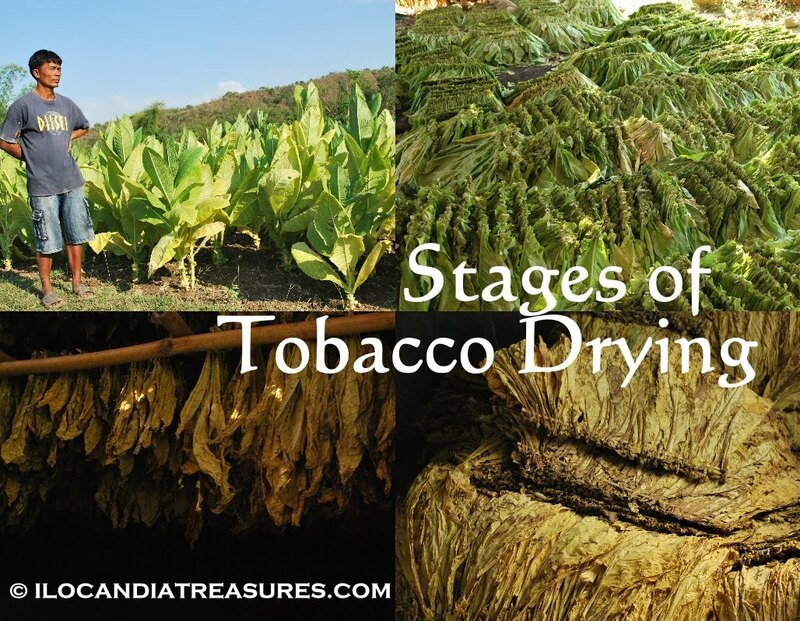 The cured tobacco leaves are usually used for smoking, chewing and snuffing. The usual product is the cigar or cigarette. Its name was derived from the Spanish word tabaco. Before reaching the Philippines, the tobacco has circled the globe. The Spaniards brought it here. The Augustinian friars brought some 6.2189 kilograms of cigar tobacco seeds in the 16th century as part of the galleon trade. It was said that more people converted to smoking than to Christianity. For four decades tobacco industry especially in Region I had been a major force in development of the provinces comprising it. On my visit to Bangued Abra, I saw along the highway that there were groups of people who harvest and queues these tobacco leaves on sticks before they are being hung. They seemed to be enjoying their activity. I did not let the chance pass by to see this activity so I dropped by at one of the barangays in the high way called Pidigan on my way back home. I was lucky to meet and interview a tobacco farmer and his family on how they cure or dry tobacco leaves. The family was so accommodating. They took me to their huge farm where they grow two types of tobaccos. These were burley and virginia. Burley tobacco is an air-cured tobacco used primarily for cigarette production. 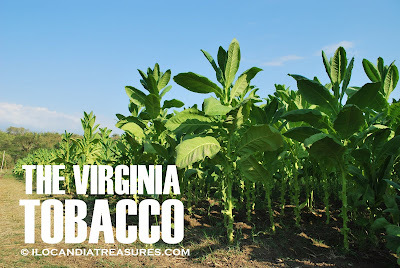 Virginia tobacco is also known as brightleaf and this is a fire-cured or flue-cured dark leaf. The virginia tobacco is considered to be the most aromatic. This is largely grown that constitutes 58% of the total tobacco area in the Ilocos provinces especially in Ilocos Sur. They showed me the pugon or furnace with a pipe or flue that conveys or releases noxious gases from the combustion of firewood. They used flue to cure the leaves of virginia while they just hang burley in an open air space. The green leaves are hung inside the furnace taking around 5 days heating before they becomes fully cured and fermented. From green color turns to yellowing then to a brown color. Then they become ready for consumption and I smelled the strong but good aroma of nice virginia tobacco. I was supposed to watch and cover the Kawayan Festival in Bangued but I was late because I spent time in Narvacan. I was thinking that the program could be held in the afternoon so I just took time. The program just ended when I arrived so I just watched some magic shows at the plaza. 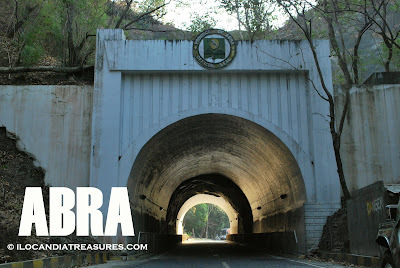 It was my very first time to visit Abra. This is a landlocked province of the Philippines bordering Ilocos Norte, Ilocos Sur, Mountain Province, Kalinga and Apayao. 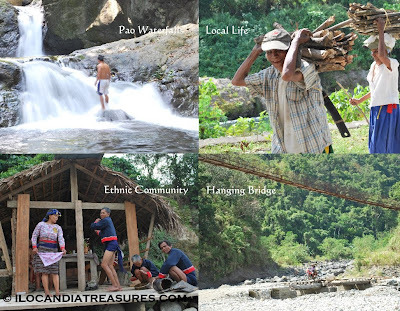 It is a part of the Cordillera Administrative Region and its capital is the town of Bangued. It has a total population of 231,000 with an area of 4198.2sq.km. The first settlers in the province were the Bontocs, Ifugao, Tingguians and Itnegs. The Ilocanos came here to trade and when they saw the place was a good one, they invaded it and the tinguians were forced to go back to the mountains. 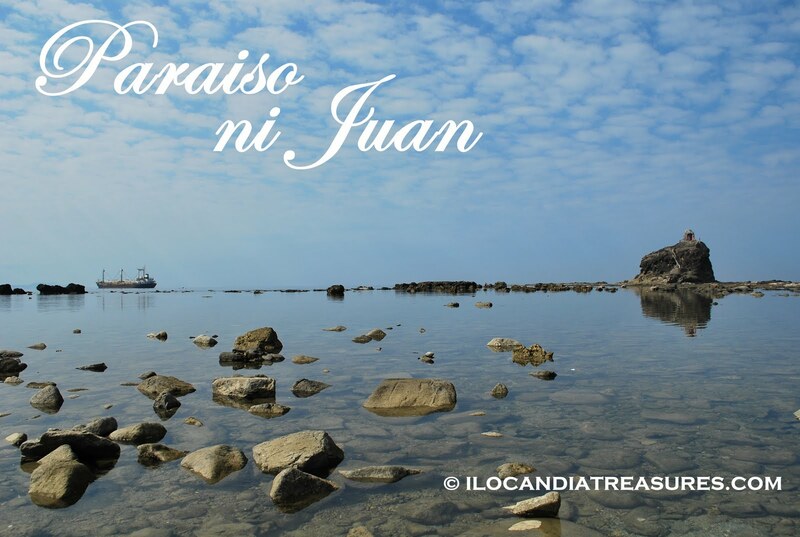 It was founded and re-established as a province in March 9, 1917 after annexing to Ilocos Sur during its financial difficulties. 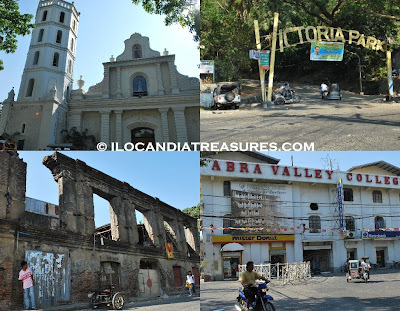 The province had gone through different historical revolutions from the establishment of garrison by the Spaniards to protect Ilocanos who converted to Christianity from Tingguian raids, to the fleeing of Gabriela Silang from Vigan during the British Occupation of the Philippines to continue the revolt started by her husband Diego Silang and to the liberation of Abra during the Battle of Abra at the end of Second World War. It used to be a controversial and hot spot for politics since there were killings and feud among politicians. But upon my visit, I noticed that it was peaceful and the lifestyle was simple. Most people grew tobacco. I visited one of the farms and talked to the farmers. I passed by the landmark of Abra which is the tunnel. I saw their church just opposite the plaza and I have seen some building ruins made of old bricks. 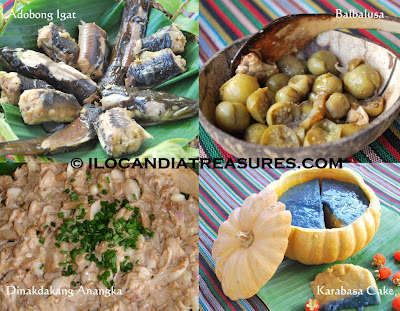 To make my travel complete, I did a sampling of their native dishes such as poqui poqui, red rice, stewed pork with black beans and the delicacies as well. On my way to visit Abra one time, I chanced upon the beautiful sight in Narvacan. 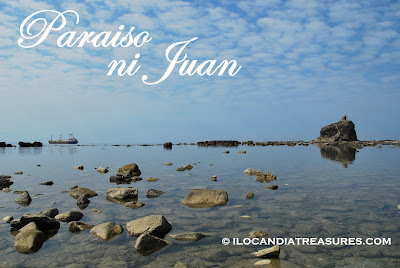 This is the coastal area of Sulvec which they call Paraiso ni Juan. Narvacan is a second class town in the province of Ilocos Sur. It was discovered by the Spanish forces sent to Vigan under the watch of Capt. Juan de Salcedo. The fleet had shipwrecked along the coast and they asked the locals of the name of their place. The natives replied “Nalbakan?” which means Are you shipwrecked? in the Ilocano dialect. The Spaniards thought that was the real answer and they started to call the place Narvacan. Actually I have seen a ship which I thought was docked in the area. With the background of the sea, it was such a beautiful sight to capture on my lens. I have already passed by but I went back to catch this ship. The time I arrived there, the ship was gone from the site but I later noticed that it kept on moving further on a partly covered area. I missed the good vantage point. Nevertheless, I was able to shoot it. I went down the rocks, upon seeing the grotto at a distance, I was intrigued by how does the image looks like on top of the rock. There was a part of water which you have to cross to get there. Since I was already there, I braved the water by taking off my shoes and folded my pants higher. I was lucky that there were fishermen who were kind enough to lend me their slippers. I left my shoes behind and went towards the grotto. There was a stair immediately before the grotto which I climbed. 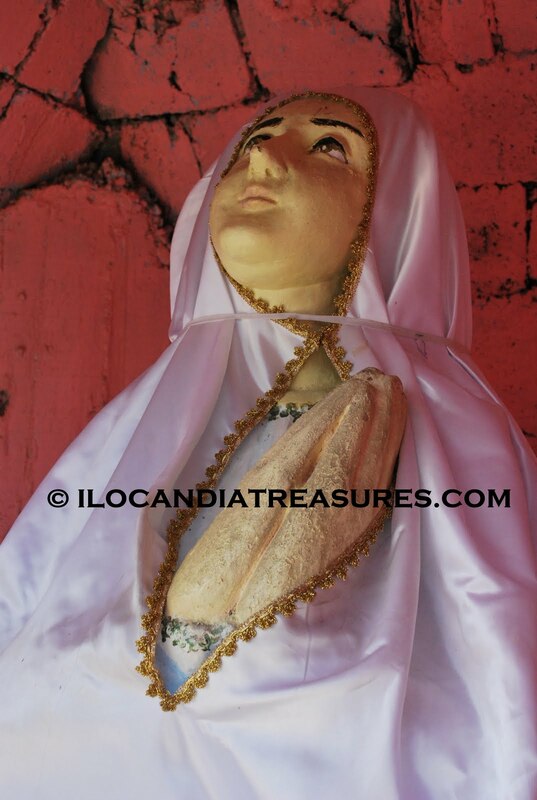 When I saw the image, it was Our Lady of Mary, the Virgin. It is a beautiful and a life-size image facing the mainland. This has been the site where the classic Filipino movie Panday was shot. I never thought that I’d be able to explore this monument. I have been passing by this coastal road and many times I have seen this grotto on a distance but its amazing to be near it. I have to end my wonderful trip to Middle East in a stopover to Kota Kinabalu. I stayed there overnight and with that short time of stay I discovered a lot more things. I traveled here several times passing by en route to Brunei. Kota Kinabalu is the capital of the state of Sabah in Malaysia. 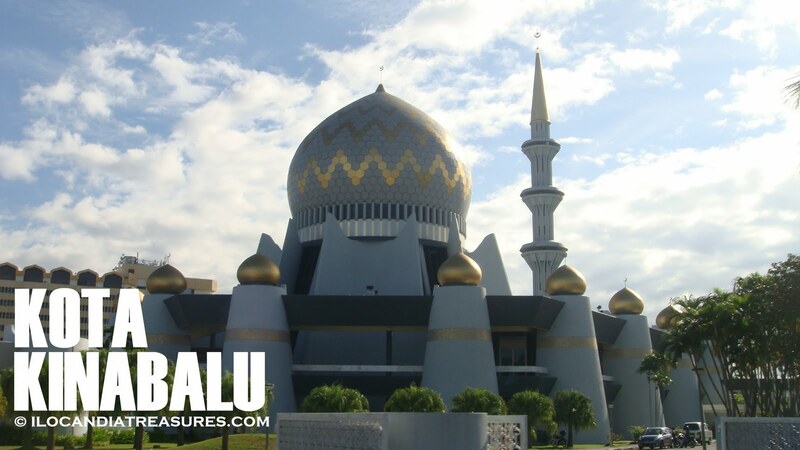 It is located in Borneo with its neighbor Brunei and Indonesian territory. It is known as K.K. and its former names are Jesselton and Api-api. This is a popular destination because of the presence of Mount Kinabalu where it got its name. A lot of trekkers around the world climb this mountain. I stayed in a dormitory where OFWs coming in and out of Borneo stay. I met a few of them. They related to me some of their sad stories leaving behind Philippines and excitement for some others to go back home. I went with the staff to send off these OFWs. I have seen the bay at the Jesselton Point. There were many motor boats as well as fishing boats. It was just adjacent to the fish market which I paid a visit. I saw different kinds of fresh fish, small and big size. I dropped by also at the dry market where I saw many local delicacies. On our way back, we chanced upon the beautiful Sabah State Mosque.